Black Ice Software - BiLPDManager version 2.11 is released! 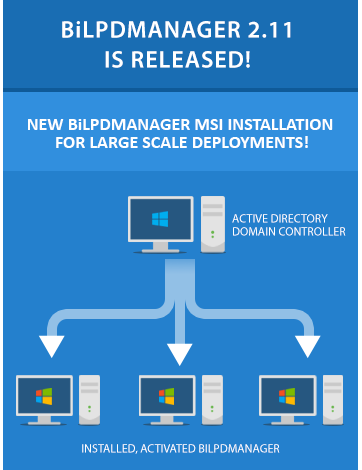 New BiLPDManager greatly simplifies large scale deployment with a new MSI Installer! Black Ice Software has released version 2.11 of the BiLPDManager. This version includes a new MSI Installer designed to greatly simplify large scale deployment. The new BiLPDManager MSI Installer allows Administrators to deploy the BiLPDManager to a large number of workstations in Active Directory environments. With the new MSI Installer, Administrators can save time by registering the BiLPDManager during the installation without any user interaction, and preconfigure the BiLPDManager to start automatically when the windows starts. For BiLPDManager availability, please contact sales at sales@blackice.com. Version 2.11 of BiLPDManager also includes further improvements when trying to start the BiLPDManager under a standard user account on the computer.